(left to right) Cemal Yilmaz (General Manager of Hitachi Kokusai Turkey), Fikret Güzel (President and Chief Operating Officer of Hitachi Kokusai Turkey) and Mizra Shukurov (Head of Information – Communication and Technology Department in the Crisis Management Center within the Ministry of Emergency Situations of the Republic of Azerbaijan). This new emergency vehicle, Hitachi from Kokusai Turkey, is fully loaded and will offer communications in the worst of situations, such as weather, turmoil, disaster recovery and assisting public safety agencies. Hitachi Kokusai Turkey’s General Manager, Cemal Yilmaz said, “The staff that respond to these terrible natural tragedies are incredibly brave and they need the best mobile communication capabilities in order to perform their roles effectively. This is the most advanced compact mobile communications vehicle that we have ever designed and built. It will save lives and we’re proud to have created a new standard in this area." 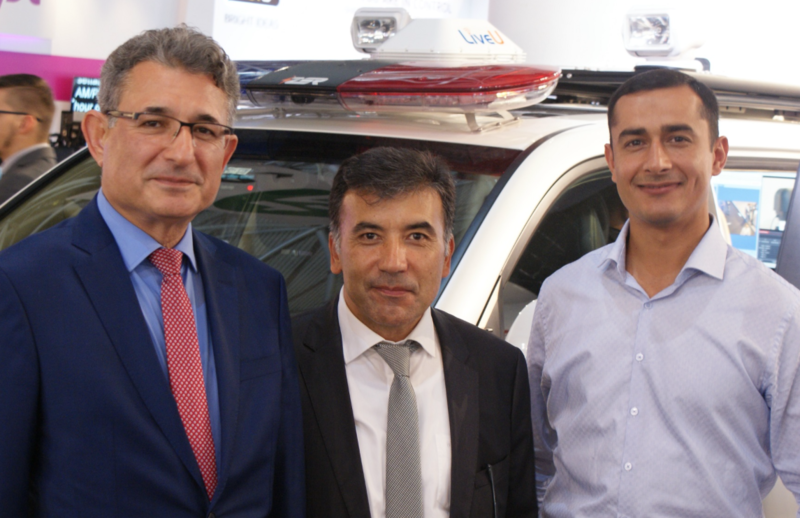 Hitachi of Kokusai Turkey delivered a new Mobile Communication Vehicle to The Ministry of Emergency Situations of the Republic of Azerbaijan. With all the vehicle’s design, systems integration, manufacturing and commissioning work was carried out at Hitachi’s specialist center outside Istanbul, Turkey, it will provide ultra-rapid communication facilities at the heart of a natural disaster zone. Having undergone extensive coach building, the modified Toyota Land Cruiser is fitted with numerous adaptations including power generators, air conditioning systems, pneumatic masts, stabilizing jacks and cranes and external lighting systems. No matter where this vehicle travels its on-board facilities ensure that it is able to communicate efficiently and reliably with control centers. On board facilities include broadband satellite communications, mobile radio communications, iridium satellite telephone and wireless 3/4G LTE technologies. Alongside these, the Mobile Communication Vehicle possesses advanced video production resources. These include Hitachi HD6000 broadcast quality wireless cameras and leading edge production tools developed by Ross, AJA, Pals, Cisco and Harmonic. This mobile video production facility will enable broadcasters to use the output in their news broadcasts.